It seemed like only yesterday when they were riding around in their toy car, crashing into walls. Now they are old enough to get behind the wheel of a real car – hopefully not crashing into walls anymore. In fact, your son or daughter is about to head off to college, which means they'll probably need a car to get around – and if you're one of the lucky parents whose child is going to a school that doesn't allow freshmen to have a car on campus, it's never early to plan for next year. Why Might Want to Consider Purchasing a Used Car? If you are thinking about purchasing a car for your college-bound child, you should probably go the used car route. Unless your child has a full ride, you're going to already be spending a small fortune on tuition, room, and board. A new car probably isn't realistically possible. But luckily, used cars have come a long way in the past 15 years. Cars are now built to be much more fuel-efficient and durable. You can easily find a quality automobile at a price that's many times cheaper than a new model. However, that doesn't mean you should just go to the lot without an idea of what you want. Let's examine what you should and shouldn't do when shopping for a car. Don't Focus on the Monthly Payments: This is a common tactic salesmen use to get a higher price for the car. By asking how much you can afford a month, they can play around with the numbers until that number is reachable. This could mean extending the lifetime of the loan, which means you'll be paying more in the long run. Focus on the price and not the monthly payments. Don't Buy on the First Visit: A dealer knows that you'll more likely buy if they can reel you in with the first visit. If they let you leave, you might find a better deal or reconsider buying a car in the first place. Even if it might be tempting to get a car now because you need one, you'll be much better off in the long run if you wait and take a night to think it over. Don't Rely on the CarFax: Ask your dealer if you can have the car inspected by a mechanic that you trust. Most dealers will agree to this as they are looking to get the sale and usually will inspect a car thoroughly themselves before putting it on the lot. If they don't, they may have something they're hiding. Don't Do Major Work on a Trade-in: If you're trading in to offset the price, you should clean the car and minor work is fine. However, overhauling the engine is not worth it. You simply won't make back the investment. Don't Sacrifice Quality for Price: Although price certainly matters, if you're buying a lemon, the markdown isn't nearly worth it. You'll end up spending more on repairs, gas, etc. Do Research Beforehand: Kelley Blue Book and Edmunds are two excellent resources. You might want to look around your local area to see what other dealers are pricing their cars at to make sure you're not paying more. Finally, ask around to friends and family to find a dealer that has a proven track record of service and quality. Do Take Multiple Test Drives: One is not enough. You might miss something the first time around or you might not get comfortable in a potentially great car the first time around. Do Haggle: What do you have to lose by doing a little negotiating before signing the dotted line. Most salesmen will work with you if they believe that you're serious about buying a car from them. Do Ask Questions: If you're unsure of a feature or why you're being charged for something, it is certainly reasonable to speak up and ask questions. Purchasing a car is a major commitment financially. You should get the car you want with the features you need at a price you can afford. When looking at used car dealers in NJ, make sure to keep these tips in mind to help you find the best car for your college-bound teenager. You'll be sure to save money and purchase a car that is dependable and safe, providing the peace of mind you need in this transitive time. Car Makers Are Starting to Introduce Next Year's Models: Although it used to be in September and October when you would see the new models, car makers are starting to introduce them in August. If a 2016 model has a lot of new upgrades from the 2015 model, you could save even more. August Is Usually a Slower Time: Families are usually just getting back from summer vacations and don't have as much money to spend on a new car. Additionally, they are trying to save for some of the expenditures that come with the holidays. If you are looking for a car, you may be able to get a good price on a new car now as there's less of a demand. 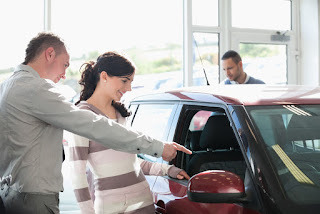 Although TrueCar recommends purchasing a car in the beginning of the month, you can get a better deal in the beginning of the week, no matter the time of the month. Just try to avoid the weekends as they tend to be busier as more people are off. Remember, when you go to 1800 Autoland in NJ, you can enjoy a great deal any time of the year. We have a number of fantastic new promotions available right now, including our $109 lease special featured on the radio. And remember, our Annual Clearance Deal is going on from now until September 8th. Stop by the showroom at 170 Rt. 22 E, Springfield, NJ to find a great car at an even better price.